Absolutely wonderful yurt with the feeling of seclusion but an easy drive into the adorable towns. 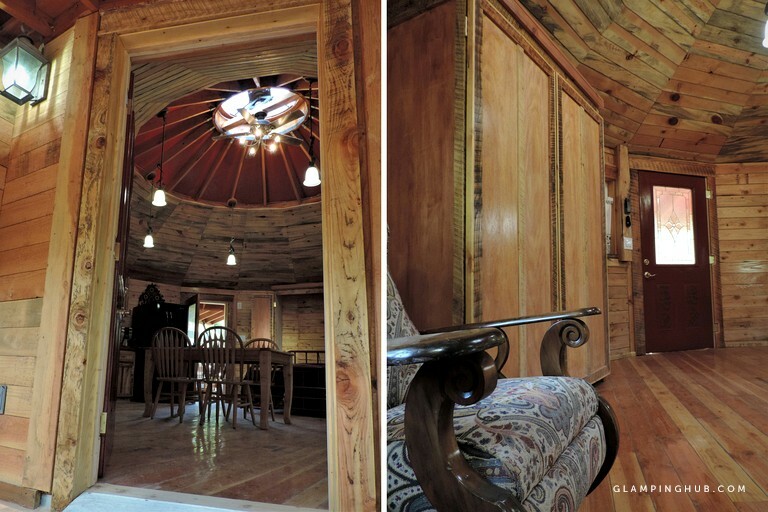 This amazing yurt rental can be found in a secluded setting just outside the heart of White Salmon, Washington. 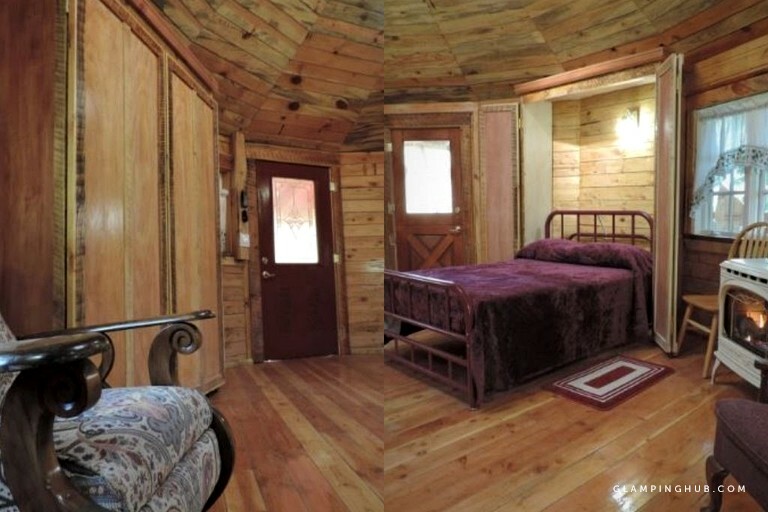 The 18-sided, custom-built, and beautifully furnished yurt has space to sleep a total of four guests and is a wonderful option for couples or small families. The yurt took two years to construct and is the perfect choice for guests hoping to enjoy a peaceful vacation thanks to the stunning rural setting of the property. There are two double beds provided, both of which are dressed in comfortable linens to help guests sleep well. 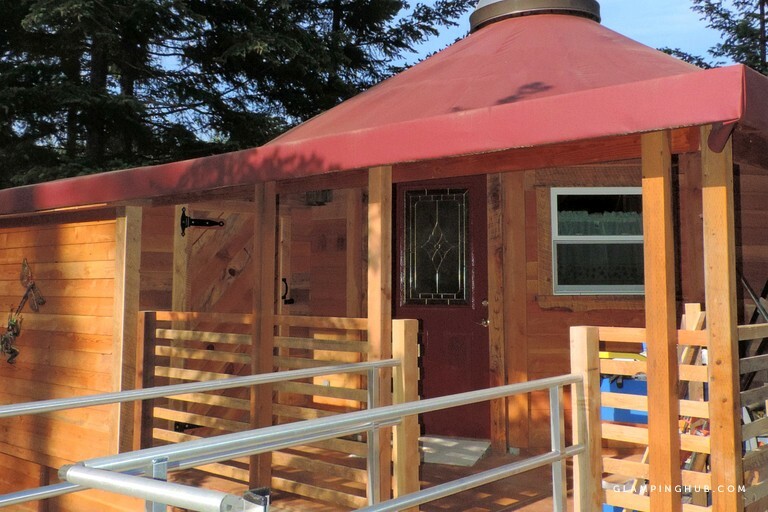 Also inside the yurt, guests will find a private bathroom with a roll-in shower with a seat and there are other facilities with transfer provisions to make the rental wheelchair-friendly. Glampers will find a well-stocked kitchen area in the property, where there are plenty of helpful utensils to ensure that meals are no hassle. In addition, glampers will love the wood-burning stove that keeps the rental toasty warm during the winter months. To ensure that guests are comfortable no matter what season they spend in the yurt, there is a fireplace, air conditioning, and heating installed. The hosts supply towels and linens and the kitchen offers everything needed to prepare tasty meals. During their stay, guests can enjoy a relaxing soak in the hot tub that can be found on a private deck that captures a view of the gorgeous natural surroundings. Glampers will love the rural setting of this property. It boasts a prime location just across the waters of the Columbia River from Hood River, buried in the historic and welcoming community of White Salmon, Washington. The rental sits at the foot of scenic, snow-capped Mt. Adams, which offers amazing views and exciting activities all year long. In addition, guests will find themselves surrounded by 100-year-old douglas fir trees that offer a glimpse of the stars in the clear countryside skies each evening. Guests will be able to enjoy all of the exciting activities offered at the Columbia Gorge during their stay. All year long guests will find plenty of things to do thanks to the gorgeous rural surroundings. In the summer, glampers will be able to make the most of the fresh air with a hike or a cycle on the scenic trails and they can get to know the wildlife that calls this area home. The nearby rivers and lakes make this the perfect destination for kayaking, white water rafting, and water skiing. In the fall, guests can enjoy windsurfing and wind-sailing, as well as rock climbing and mountain biking if they are keen to catch a thrill. The snowy winter months make this the ideal spot for skiing, snowboarding, and cross-country skiing. Also nearby, there are stables for exploring the area on horseback and golf courses waiting to be discovered. Picking huckleberries is also a wonderful way to pass the time during a stay here. A refundable damage deposit of $150 is required. Dogs may be welcome but must be approved by the hosts and may be subject to an additional fee.